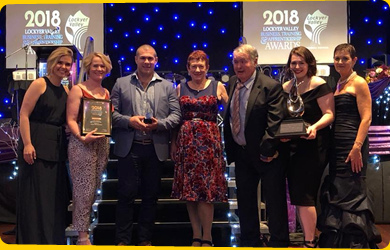 30 OCTOBER, 2018 - Porters Plainland Hotel are the proud winners of Best Food & Dining Business and Business of the Year at this year's Lockyer Valley Business, Training & Apprenticeship Awards. Congratulations to our awesome team on your achievement, and thank you to all our loyal customers for your continued support and appreciation! 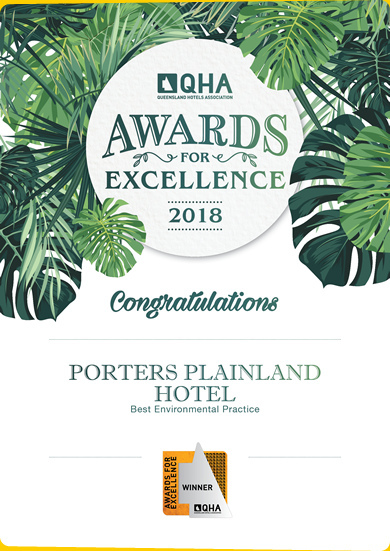 10 OCTOBER, 2018 - Porters Plainland Hotel are the proud winners of the Best Environmental Practice category at this year's Queensland Hotels Association Awards for Excellence. We've been hard at work for many years to achieve the best practice possible, and the results speak for themselves. 10 per cent of our daily power is now generated from a rooftop solar array, our own water treatment plant recycles up to 8000 litres a day, we recycle all glass, cans, plastic and cardboard, and the hotel's 130-tree citrus orchard generates limes and lemons for use in the bar! 22 SEPTEMBER, 2016 - Porters Plainland Hotel are the proud winners of the Best Keno Venue category at this year's Australian Hotels Association National Awards for Excellence. Thank you to all our wonderful Keno players who enjoy the game, and to our awesome bar staff who ensure everyone gets their tickets on time. Everyone's a winner! 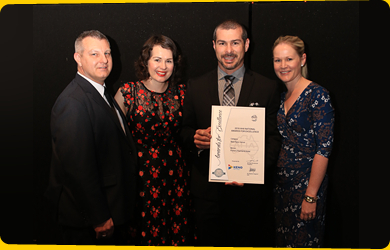 30 SEPTEMBER, 2015 - Porters Plainland Hotel has taken out the Best Keno Facility award at this year's Queensland Hotels Association 23rd annual awards for excellence. The honour was awarded to the venue with the best Keno setup and displays, sales performance, promotional activity and customer service, with Porters singled out from a field of about a dozen hotels statewide. 26 MAY, 2008 - Family Business Australia, the peak body for family and private enterprises in Australia, have awarded Porters Plainland Hotel 'Third Generation Family Business of the Year (Qld)' for the second year running. Meanwhile Schultes Meat Tavern of Plainland were named Second Generation Family Business of the Year in the FBA awards. 1 JANUARY, 2008 - Warrego Highway travellers will have noticed the slabs going up over recent months, and on Saturday 22 December the hard work finally paid off with the grand opening of the Plainland Hotel's huge new drive-through bottleshop, just in time for Christmas. 12 NOVEMBER, 2007 - 30 years of dedication were rewarded in a surprise gong from Queensland's peak hotels body recently, when Bob and Julie Porter were named the QHA Hoteliers of the Year for 2007. The Queensland Hotels Association's most prestigious award was the last to be presented at the annual awards night held in Brisbane on 1 November, and Bob and Julie freely admit to being 'totally surprised'. 30 JULY, 2006 - For the Porters, now in their third generation behind the bar at the Plainland Hotel, hospitality runs in the blood. This July the family celebrates sixty years since Richard and Rita Porter took over management of the Warrego Highway landmark, at the gateway to Queensland's Lockyer Valley. 7 OCTOBER, 2003 - Porters Plainland Hotel has been named Queensland's Best Hotel/Tavern Redevelopment Under $1 Million in this year's Queensland Hotels Association (QHA) awards. 16 SEPTEMBER, 2003 - It was a dream come true for 16 local enthusiasts this Monday night, when Australian snooker legend Eddie Charlton played the Plainland Hotel.